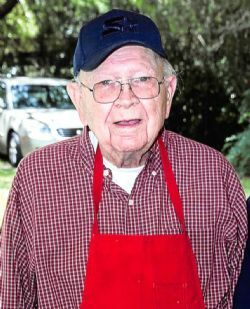 Johnny Clay Fussell A native of Brushy Creek, AL and resident Saraland, AL died on Thursday, January 31, 2019 at the age of 91. Mr. Fussell was a veteran of the United States Navy in WWII having served on the USS Pittsburgh. He loved camping, fishing and playing golf with his wife. He also loved woodworking. He was preceded in death by his parents, Eunice and John T. Fussell; wife, Betty Fussell; three brothers and two sisters; granddaughter, Lori Fussell. He is survived by a son, John Clayton (Kathy) Fussell; three grandchildren, Jodi (Howard) Blumenthal, Shari (Mike) Walsh, Tiffany (Jason) Sapp; eight great grandsons and one great granddaughter. Visitation will be held from Mobile Memorial Gardens Funeral Home on Saturday, February 2, 2019 from 1:30 PM until 2:30 PM followed by graveside services in Mobile Memorial Gardens. The family would like to give a special thanks to the staff of W.F. Green Veterans Facility for their care of Mr. Fussell. A chapel service will be held at 2:30pm on Saturday, 02/02/2019.